Boat from 2003. Only 3 weeks use every year. Second owner. Length 6,85m - Beam: 4,98. 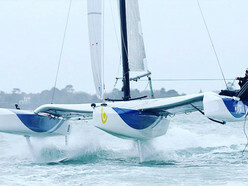 Daggerboards, rubbers from Tricat 23,5 (taller than origin. Mainsail mylar Incidence in good condition, jib on furler to be change, spinnaker nylon 24sm ok.
Road trailer PAM for the boat, good condition new winch.